It’s important that the roof on your home or business is kept in optimal condition so that it can provide the protection you are counting on. 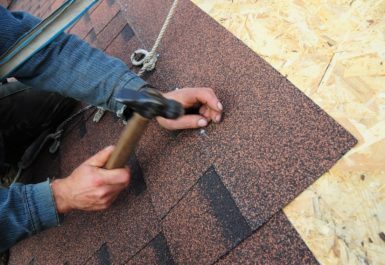 If you’re concerned that your roof might need to be repaired or replaced in the near future, let the trusted roof installation experts at Daech & Bauer Roofing take a look. We’ve completed more than 10,000 projects in the Maryville, Illinois area and have developed a reputation as one of the most reliable contractors in the area because of our dedication to craftsmanship and customer service. We only use products from trusted manufacturers, including Owens Corning™ and CertainTeed, and we promise to match any local competitors who offer the same work for less. Plus, for roof installation projects, we believe in providing a complete roofing system that offers superior protection against water intrusion and blow-offs and allows for the necessary levels of attic ventilation to help prevent deterioration. Another factor that helps Daech & Bauer stand out from the competition is our experience with the often confusing insurance claim process. If a home or commercial building in the Maryville area suffers hail or other weather-related damage, we will take part in the inspection by your insurance company’s adjustor to ensure that all necessary repairs are adequately noted and sufficient compensation is provided. And, once we’ve returned your roof to optimal condition, we will back our work with a five-year labor warranty to give you additional peace of mind. Contact Daech & Bauer Roofing today and let us handle all of your roof installation and repair needs.